The workshop is a collaboration between Co-de-iT, Fablab Torino, Officine Arduino, based on ongoing Co-de-iT research called “inFORMed matter“. The “inFORMed matter” research project focuses on the exploration of additive fabrication processes. It explores producing form through the morphogenetic properties and capacities of matter by embedding information structures during the fabrication process itself. The goal is to go beyond the current state of prototyping, in which the physical prototype is as close as possible to a clone of its digital counterpart, making fabrication a pure replication. Instead, by coding and embedding extra levels of information the production and digital fabrication phase becomes an integral part of the design process. The embedded information maps and defines material features and behaviors and different deployment patterns of the physical and aesthetic properties. 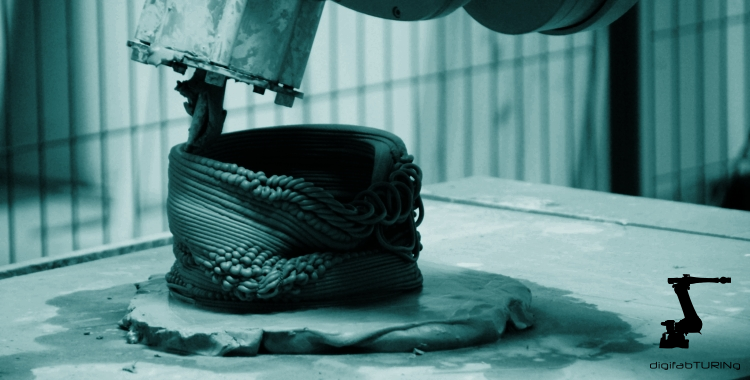 The workshop focuses on the exploration and development of the whole design and digital manufacturing process through additive processes of ceramic mixture materials. Anticipate material behavior through digital simulation: Test and apply different tool-based conditions and parameters (extrusion direction angle, speed of extrusion, variable layer thickness, etc … ) and evaluate the consequent material behavior to get useful feedback for the digital model's next iteration. The aim is to understand how to embed material properties as code and information during the digital design phase, fine tuning it towards the desired outcome. Seamless and shorter design-to-machine pipeline: One, by directly informing the machines by generating the necessary code in the design tool. Two, by building the design process around the machine's capacities. Embed morphogenetic material properties as design factors: Understand and manage such properties, behaviors and their potential morphological outcomes for different materials, from clay to biologic matter, to map and use them as an atlas of expressive possibilities and performances of the material. Understand constraints and opportunities determined by the chosen constructor agent or machine: Learn to use and manage different machines to handle the extrusion tool for additive processes and learn to evaluate and exploit the influence, constraints, and given opportunities provided by different machines and movement technologies. During the workshop we will use tools to handle the special ceramic extruder, a customized 3D printer, type delta, and a 6-axis Comau Robot NJ 60. The final output will be the result of influence, cooperation, and conflict of these. Only by successfully combining computational simulation, material properties and capacities, and machine constraints and opportunities we can effectively evaluate and push further the design process potential. Through this we can foster design and fabrication skills and sensibilities for a more comprehensive awareness of relations between computation and material aspects.